Google Search Console had some serious issues with the robots.txt file for this site that took me a while to resolve. It kept giving cryptic error messages and suggesting I read a page that didn’t really explain anything. 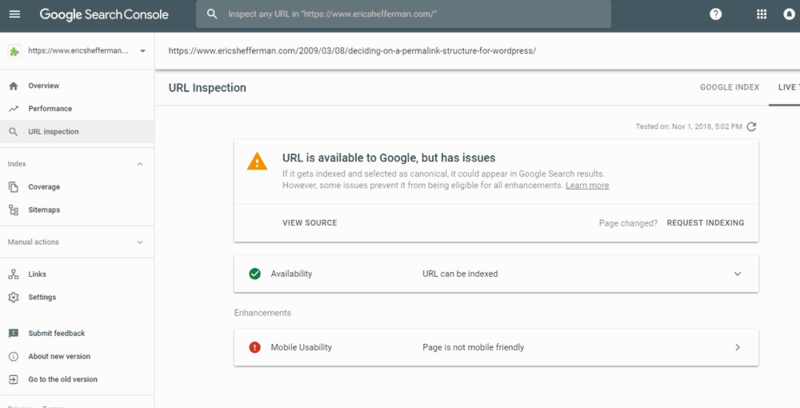 The instructions I followed from wpbeginner.com suggested adding this new secure site to the google search console. And there I was told that my site was not mobile-friendly! One of the things that kept me from the change to SSL was that my hosting company, Pair.com, did not have any nice (convenient) way to use the free Let’s Encrypt SLL certificates. Pair now offers an easy one click interface to set up SSL and they automatically renew the certificates, so there’s really no excuse to not do it. Click the Let’s Encrypt button and you’re good to go! After a few minutes (so that you think the computer was doing some really difficult task) it’ll present you with your domain name with a super-intelligent shade of green lock next to it. All done with the easy part! This site launched on September 11, 2006. At the time, I didn’t love the concept of running software on the server to create the site. I was also looking at this Blosxom software which generated a static site. It’s usage was a little programmer-like rather than writing-like, and WordPress promised a friendly interface for typing. Running live website creation software on the server seemed like a bad idea to me. So open for all kinds of security issues, performance issues, and (as time has proved) software update issues. So much yuck for the sake of a certain type of convenience. There is a LOT that can be done with free online services — sometimes things that probably go way beyond what the service creators envisioned. Jetpack kills Contact Form 7 — Like Because Why Not? JetPack installs it’s own comment form and kills your nice contact forms that you spent lots of time getting just right… <sarcasm>thanks.</sarcasm> WordPress gets me again! See this: https://contactform7.com/jetpack-overrides-contact-forms/ This is very frustrating since one of the happiest features on my site is that my contact Eric Shefferman form has a drop down selection for Don’t bother … Read moreJetpack kills Contact Form 7 — Like Because Why Not?